In the spirit of Old McDonald and onomatopoeia sound effects. Jez Alborough's usual cast of animals characters are trying to hitch a ride on a tractor driven by Sheep. Farmer Dougal hears the all noise and jumps out of bed to see what is going on. All he sees is his tractor sitting in place and animals grazing quietly, nearby. After he returns to bed, the animals are ready to ride again. The story reminded me of Duck on a Bike by David Shannon -- animals and vehicles. As a read aloud, there are animal sounds to make. The illustrations are in Alborough's comic style. I will say that the toothy grin of the sheep is a little unnerving. Farm yard animals quack, baa, cluck, maa, squeek, meow and woof. As the pages turn, the animals seem to be cheerfully jumbled up together. It is not until the last two page spread that their goal is revealed. Krilanovich paints with lovely texture and pattens. Her chickens are especially beautiful. The book plays with the Duck Duck Goose game chant, adding in animal sounds. Dancing is just plain fun for everyone. Dancing ladybugs go Tippity! Tippity!, elephants go Stompity! Stompity!, ducks' feet go Slappity! Slappity! and so on, with insects and lizards and animals of all sizes dancing up a storm. Nice rhythm and rhyme swing the text. It would make an excellent storytime read-aloud with lots of opportunities for audience participation. Marc Brown's collage illustrations pop with color and texture. The simple shapes might inspire some young artists. I am putting this one in my "have book, will travel" librarian's bag. Teens and other readers of Young Adult Literature will have the opportunity to listen to bestselling titles and required reading classics this summer. 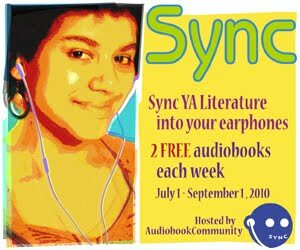 Each week from June 23 - August 17, 2011, SYNC will offer two free audiobook downloads. The audiobook pairings will include a popular YA title and a classic that connects with the YA title's theme and is likely to show up on a student's summer reading lists. For example, Maggie Stiefvater's Shiver, the first book in a popular series with strong allusions to Romeo & Juliet, will be paired with Shakespeare's classic. the fresh Potter material – to be unveiled later this year - already stretches to 18,000 words about the novels' characters, places and objects, with more to come. From Professor McGonagall's love for a Muggle as a young woman, to how the Dursleys met (Petunia was working in an office); from new information about Slytherin, Ravenclaw and Hufflepuff houses, to details about wand wood, Rowling's writing will be just one part of the richly interactive, free Pottermore.com website, which is intended to bring the Harry Potter storylines to interactive life for readers. The CIP in this books shows the LC subject heading as "Berchtold zu Sonnenburg, Maria Anna Mozart, Reichsfrelin von, 1751-1829" aka Maria Anna Mozart, Wolfgang's sister. Rusch uses the piano sonata form, which she describes before the story begins, to frame her story as Maria played them frequently. Billed as Wonders of Nature! and Child Geniuses!, Maria and her younger brother, Wolfgang performed together across Europe. The two spoke French and Italian and had rich imaginations. A composer and prodigy in her own right, Maria noted down Wolfgang's compositions for him, before he could write. When their father chose to focus on Wolfgang as a solo performer, Maria was left behind at home, a move that devastated her. The siblings remained close though even after Maria's marriage and many of Wolfgang's compositions were dedicated to his sister. Artists, Johnson and Francher use a collage of woven fabrics, rich brocades and embroidered satins, to bring the story to life. The textiles act as a canvas for the paintings and give them richness and depth. The paint is laid on thickly in places rendering a three dimensional feel to the figures. The pianos are layered with images of original hand written sheet music from the Mozart family collection. I would love to see the original artwork for this book. A brief but complete bibliography includes books, letters and documents and personal interviews. An "encore" summary of Maria Anna Mozart's life fills out details of her story. This book is beautifully executed in every way. My inner school librarian is putting this book on my "must purchase" list. The book is a happy tribute to every child who ever filled a box, sack, pail, or gym sock with a rock collection. The ABC style book is wholly original and an imaginative delight. Each page focuses on a rock in the shape of a letter of the alphabet. A rock shaped like a lower case "e" illustrates "elephant" along with a rock that looks just like the head of an elephant, with an upraised trunk. The two page spread for "o is for Ouch!" depicts a donut shaped "'o" rock with ouch depicted by a smooth oval stone "face" pitted with holes and grooves that look just like a face, grimacing. I know I exclaimed or laughed out loud at some of the whimsical selections. McGuirk's interpretation of these amorphous shapes is a wonder because we see them too! Her rocks are identified as fossiliferous sandstone and the geologic process that forms this kind of sedimentary rock is also described. McGuirk began collecting these rocks on Florida beaches although she specifies that the letter "X" is from Maine. This book has wide classroom applications from art teachers to science teachers. It would perfectly pair with Byrd Baylor's classic Everybody needs a Rock . School gardens are often started but tend to languish despite the best of intentions of teachers, students and parents. This book might encourage a community to try again. The children at the Pepper Lane Elementary are inspired by a visit from Miss Marigold, the garden lady to start a garden at their school. They work together with help from adults. Even Mr. Barkley, the school's cranky neighbor, lends his gardening expertise. Building a garden is hard work. Ground must be cleared and prepared then seeds are planted and watered. It takes patience to wait for vegetables to grow and flowers to bloom but their efforts are rewarded and celebrated at the end. Suggestions for starting a school garden are shared. Pig lives on an apple farm. His owner feeds him every kind of apple delicacy but Pig is tired of apples and longs for the vegetables growing in a nearby garden. When Pig manages to get into the garden he is in heaven. He discovers a passion for squash. When Mrs. Pippins discovers him in the garden, she secures him in his muddy pig pen and he cannot escape. He prepares the ground in his pen for planting and "passes" the seeds from the squash he ate. He patiently waits and before long has his own squash garden. Thursman follows the story with two pages of organic gardening tips. Illustrator, Ward's apple trees are filled with apples and text from apple recipes. Pig's method for planting his seeds is very...organic--to be sure. THAT will get the kids attention! Our Shadow Garden by Cherie Foster Golburn, art by the children of the Children's Cancer Hospital at M.D.Anderson Cancer Center. Bright Sky Press, 2011. The Children's Art Project at M.D.Anderson Cancer Center funds programs for children who are cancer patients at the center. The project has long been known for its Christmas cards but has also branched out to beautiful stationary and gift items as well as cards for other holidays. This book is a compilation of artwork by forty-seven of those patients. When a child's grandmother becomes ill with cancer, she cannot work in her garden any more. Told in the first person, the child and "Poppa" work to revamp Nana's garden. The two of them create a shadow garden that can be enjoyed in the evening. Soft lights are hung in the trees and flowers that bloom in the cool of the evening are added to the beds. The flowers' fragrances waft through the air. Animals that only come out in the evening visit the garden. A well placed bench provides a spot to rest and to listen. The creation of the garden gives the child and Poppa a focus and way to contribute to their loved one's recovery. A glossary of plant and garden terms (like diurnal and germinate) is included along with a list of gardening websites. Information on planning a shadow garden appear in sidebars on the pages along with specific information about shadow garden plants. Traditions of planting by the phases of the moon are explained also. Golburn is a certified Texas Master Gardener and is knowledgeable about her subject. Gardens have a healing power. More than just a "gift" book, the content is useful to gardeners and families who are dealing with cancer. When I mentioned there was a children's book about Hendrix to the teacher dressed like Jimi Hendrix for our "dress like a rock star" day at school a few weeks ago, everyone within earshot was stunned. The story of Hendrix's death has overshadowed his music. When one of the children asked the teacher if he was dressed as Michael Jackson, I wondered if any children at the school had even heard of Hendrix. Golio tells Hendrix's story with poetic language and imagery. Blue was the whoosh of cool water splashing over rocks. Green, the rustle of a thousand leaves. Did Jimmy really see the world in this way or is this poetic license? This feels researched and informed thanks to the extensive list of research sources, the discography of music and videos, and website list included at the end. Golio imparts a great deal of information about Hendrix's life without resorting to a dry narration of facts. We understand there is no mother in the boy's life through the descriptions of his relationship with his father. Jimmy was fascinated with all kinds of sound and his imagination saw colors in the noises and rhythms of the city and nature. The boy was also an artist, often sketching and painting. A self-taught guitarist, his music took off in a whole new direction when he acquired an electric guitar and discovered how amps and guitar strings could be used to create a unique sounds. The author addresses Hendrix's death honestly and in a straight forward manner in the author's note. He focuses on substance abuse and addiction as a disease that people can recover from with help. He draws on his own years as a counselor in the discussion and points to several websites that help families and children understand the issue and find assistance. His comments would be a comfort and useful to young people who are facing similar problems themselves or in their family. Before There Was Mozart: The Story of Joseph Boulogne, Chevalier de Saint-George by Lesa Cline-Ransome and James E. Ransome, Schwartz & Wade, 2011. Joseph Boulogne was born in the West Indies in 1745. His mother was a slave on his white father's plantation. Cherished by his parents, he was educated and taught music from an early age. Joseph was extremely gifted, excelling at everything he tried. When his father returned to France, Joseph and his mother accompanied him. Joseph was thrust into a world that did not accept him as a person of color. His talent was unmistakable though and he earned a place in the king's court as soloist, conductor and composer, even inspiring a young Mozart with his genius. He was also a master swordsman, a fact that intrigued the elementary music classes where we shared this book..
James Ransome drenches the paintings with sunlight and tropical color in Joseph's early island years. Later in France, the richness of the French court glows on the pages. The Ransomes provide a wonderful opportunity here to learn of a less well known musician and his contributions to the world of classical music. Well, despite a foul illness, (that is receding somewhat as I write) I was able to read a few books and listen to part of another. I also spent time reading blogs of other participants and writing some quick reviews. I have more hours left in my 48 hour block but have to be at work early tomorrow to start closing down the library for the school year. Yawn. I am so fond of these relatively short but utterly readable little books Paulsen has been writing recently. They are full of humor and story that resonates with readers 4th grade and up. With page counts between 100-120 pages, they are not intimidating to readers who eye a book for its thickness or thinness. Kevin knows the difference between telling the truth and telling a lie. He just finds that lies are easier on everyone. He has rules for telling lies but even his experience and talent cannot keep him from becoming hopelessly entangled in the multiple threads he is working. There is trouble on his home front too when his father's business travel begins to interfere with their family's life. He realizes his duplicity may have hurt his parent's relationship too. Kevin realizes the value of truth telling in a poignant moment with the little boy he babysits. He comes clean with a clear-eyed maturity that is a wondrous thing to behold. As he writes letters of apology to all the people he has lied to and accepts the consequences that befall him, life gets better. "It's like he has a gift, " Henry said to Riley as they flipped on their flashlights and made their way down the tunnel toward Reed's voice. "No matter where we go or what we do, he's like a compass pointing north when it comes to locating smelly goo." "Extraordinary," Riley agreed. "You work so hard to come up with adventures and somehow it always come down to Reed in a pile of poop." Time reading: 1 hour, 120 pages. Terrific story of a family moving to upstate New York in the middle of winter to start an ice cream parlor. Tess is in seventh grade and her little brother, Noah, is eight years old. He is also deaf. Their dad is out of the picture. Their ma is a dreamer and hard to stop when she gets an idea in her head. She also suffers from what she calls Shooting Stars. Tess learns the condition has another name, bipolar disorder. Their new home is in a senior community which at first seems bizarre but turns out to be a blessing as the community takes the children into their hearts as surrogate grandparents. Ma works nonstop, dreaming up new flavors of ice cream and renovating the space that will become their store. Through her efforts, the downtown business district begins to dust itself off and shine. Tess begins to make friends and things are looking up on the eve of the store's grand opening when the Shooting Stars return and Ma crashes into despair and depression. It is up to Tess and her friends and new family from the senior community to make the business a success. Full of admiration for Kent's storytelling. Calli Gold does not DO anything. She does not skate competitively like her sister or play sports like her brother. She is content to be the sedate middle child. She has patience and empathy for others. She notices things that fly by the notice of her parents as they rush their children from one activity to another. Her family's over-scheduled and hectic life is hard on everyone. Still her father thinks Calli has just not discovered her talent or passion yet and needs an activity of her own. But, when Calli becomes involved in a student peer support group at school, her family can barely find the time to attend her group's Friendship Fair. Calli is an endearing character with a serene inner strength. This reader applauded when she finally called out her parents about their misplaced priorities. I really enjoyed this family story, nice parents (though they need a head slap) a nice brother, bratty drama queen older sister for some tension and conflict. Good for all of us to reflect on what really is important and how we spend our family time. Time reading: 1.5 hours, 208 pages. I have participated in the 48 Hour Book Challenge every year since MotherReader (@ http://www.motherreader.com/) began it. I was planning to read along this year too, but alas, a foul virus or SOMETHING has gotten a firm hold on my respiratory system and I am doing more coughing and napping than reading. I've spent a year of dodging, evading, bobbing and weaving, ducking, retreating, and hiding from the various germs that coat the surfaces of library books and public schools. I was successful until the reading reward FIELD TRIP. Alas, there is no out-running the recycled air and germ smeared, virus encrusted surfaces of a bouncing/sliding emporium. 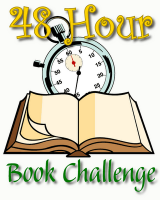 Still, I plan to attempt some reading because, over the past years, I have read some of my favorite books during this annual weekend challenge. I've participated on airplanes, during high school graduation ceremonies, and sometimes, from the comfort of my easy chair. I hope I can accomplish 48 minutes. I am grateful to MR and to her dedication to this splendid event.